Just so you know, if the title misled you, that this isn't going to be a post about how glad I am that Seth is going to be somebody's big brother (though I am glad about that). 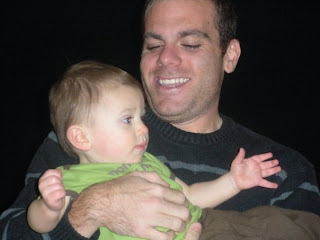 This is my brother Adam, playing with Seth at Christmas. We aren't super close, as far as siblings go. Circumstances out of our control kind of dictated that as we grew up. But now that we are both adults, we are finding our way in this brother/sister relationship. I learned that when he heard about our recent break-in, he immediately said some not-too-repeatable words, followed by something to the effect of "she puts too much info on her blog and/or Facebook!" and "she needs to stop talking to people on the Internet!" Now, while my first reaction was, "whatever, dude -- you're pretty generous with your Facebook status, too," the more I thought about it, I think his reaction was purely brotherly protectiveness. And it was sweet. So, Adam, for what it's worth, I am being a little more cautious with how informative my blog posts and Facebook updates are, but also, for the record, I went back through my published content the week before the break-in, and am fairly confident that it wasn't anything I said that led to the violation of our privacy. Now, that said, I promised y'all that I would fill you in on what exactly happened last weekend, so, without giving too much away, here is how last Friday and the days following played out. Jim and I arrived home at the exact same time that afternoon. This is no small miracle. He was coming from work; I was coming home from MOPS. Had he not been home at the exact time as I, things may have turned out differently, as far as how we discovered the crime and even Seth's safety. You see, I was supposed to have some medical tests -- mostly a blood draw and urinalysis -- for our insurance, and the home nurse was waiting at our home when we arrived. Had I been alone, I most likely would have unbuckled Seth from his car seat, and sent him into the house by himself while I hurried to tell the nurse that we needed to get on with things (I seriously had to pee!). As it were, Jim pulled into the garage first, and noticed that the door that enters into our kitchen was ajar. In addition, some things in the garage looked "off" -- to the point that Jim knew it wouldn't have been me that had been in them. Jim walked up the three steps to our kitchen, and immediately told me to stay out and to leave Seth in his car seat -- that the back door had been "busted out." Naively, I thought, "oh, somebody threw a rock or something at the door." Jim called the police, and we were instructed to stay out of the home until they arrived. Um, yea, not gonna happen. Did I mention that I really, really had to pee? I told Jim I wouldn't touch anything, that I'd just slip into our half-bath, do my thing, and get back in the driveway. In the two steps it took to get into our bathroom, I saw the destruction that was our kitchen. Our sliding glass patio doors were shattered -- shattered -- into more pieces than I could imagine. Glass had sprayed into our dining room and living room, all over Seth's highchair, into my plants. The HUGE rock that had been thrown through the doors lay in the midst of all the glass, firmly indented into my kitchen floor. Seth's diaper bag had been emptied out onto the counters, and I think it was that sight that made me quickly realize how bad this was all going to be. I used the bathroom, and joined Jim in the driveway, saying over and over, "they took his diaper bag." It just conveyed my incredulity at how desensitized the thief must have been as he ransacked our home. In the time it took for the police officers to arrive, I had sent Seth over to a neighbors home. I wish I could say that I used this half-hour to calm myself down, but as we began to realize all that was missing from the garage (since it was all we could see at the time), my stress level only rose. We gave our initial statements to the officers, and the detective arrived to do the first walk-through. As he came back out the front door, we could tell from the look on his face that things were not good. I asked him if the house itself was destroyed -- you know how you see TV depict break-ins with knife-slashed couch cushions and broken furniture? -- and he said we were a 6 on a 10-scale. Great. I'll spare you the details of Jim's and my walk-through. Let's just say that by the time we made it to the second floor, I was a mess. The sense of disbelief quickly turned to shock and then anger and then swung back to pure violation. I just sat in Seth's nursery and bawled. The detective came in to inform me that first responders had been called to check me out, due to the pregnancy, so I was instructed to sit quietly in the living room and wait for the EMTs. So I did. But it didn't do any good. The damage, so to speak, was done, and my blood pressure was firmly planted in the 160/110 range. After several spaced out readings, and a call to Dr. Morgan, I was faced with the reality of my first ambulance ride. I only have two words for that. No, wait. Four: not fun; tin can. I know this post is getting long....I'll try to wrap it up. Jim called me while I was in the ambulance to make other more permanent arrangements for Seth, since we didn't know how the rest of the day would unfold. In case you are wondering, yes, you can take cell phone calls while strapped to an ambulance gurney if you are not critical and smile sweetly at your EMT. (Or maybe you don't need the sacharine smile, but I figured it couldn't hurt.) So, Seth was shipped off to our friend Jen's home (THANK YOU a million times over to Jen and Jonathan for stepping up), and Jim was left to deal with the ridiculous amount of phone calls -- home center to order a replacement door, work to ask coworkers to come board up the huge hole in the back of our house, insurance people of all types, credit card companies, banks, finance institutions, tenants, parents...ugh. As bad as my trip to Labor and Delivery was, I definitely think Jim got the worse end of the deal. My actual experience at the hospital was good. Admin was easy; the food doesn't quite compare to Toledo Hospital; but the nurses were great, and hey, at least no one tried to kill me with their incompetence. ;) Itty Bitty was doing well, so after several long hours of monitoring, I was released from the hospital. I guess this post turned a little more into how the break-in affected my health than the actual break-in. Oh well. As far as what was stolen, well, pretty much imagine what you think would be stolen from someone's house, and there you have it. Flat screen, DVD players, laptops, GPS, webcam, tools, MY BREAST PUMP!!! (and yes, I'm really unhappy about that! ), heirloom silver, miscelaneous valuables, and the golden egg -- our entire safe, full of all the things you are supposed to keep in a locked, fireproof safe. Ugh. So far, the police have been, ahem, well, awful; the insurance people have been surprisingly good to work with (imagine that? ); and we're learning which of our neighbors we like and can trust and which ones we might not be inviting over for dinner anytime soon. There was another attempted burglary in our subdivision on Thursday; that family was home. (Nice, I know. Welcome to suburbia). There are some leads; there are some suspects. How things pan out from here are very much out of our hands. And that's pretty much that. There is more that I may choose to ramble about in the coming weeks -- how my miscarriages have prepared me for the emotions that have surfaced in the wake of this break-in; how gender truly affects how people react to certain situations; Facebook etiquete in times of crisis; channeling cynicism and anger. But for now...I'm just going to say goodnight and watch Jim play guitar hero. *hugs* Sending more love & prayers your way! Thankful that everyone is okay--can't wait until tomorrow to hear the news! Funny, I've got a brother named Adam and would have to say that our relationship seems to mirror ya'lls! Oh! You poor sweetie. I am so, so sorry. I'm really sorry you had to experience all that. Why in the world would they take a diaper bag and breast pump? People can be so silly....I think about your family a lot. Oh Mon, I am just crushed for you! I can not even imagine how that must have felt to see your house, your family's home, in that condition. And to loose your pictures, how devestating. I am going to PRAY they are able to somehow recover AT LEAST your computers with those files on them!!! How did they get all of this stuff out of your house??? Did they just drive a big-ol-van up to your house in the MIDDLE OF THE DAY and no one notice?!?? How does that even happen?!? Sorry, those are all questions you are probably either asking yourself or tired of answering for other people. Oh, Monica. I'm all goose-bumpy after reading this. I am SO sorry for what you've had to go through. I thank God you, Jim, Seth, and IB are okay, physically at least. I'm a real-life friend of Christy (from Between Here & Home) and I've been reading your blog for awhile. I am so, so sorry to hear of your break-in, but very glad you and your family are ok. Break-ins are scary, sickening, and angering! One thing I did notice on your blog is that on the right side under the heading "Our New Home Sweet Home" you have a link to your home, which features a picture of it and descriptions such as "PRIVACY! wooded lot that backs up to a hill. There is NOBODY behind us, and there never will be." It's likely that whoever broke into your home does not read your blog, but what if...?? technology is so clever these days. through simple sites like www.411.com and Google maps/images, we can find out more than our neighbors than they may want us to know. Even many county websites feature a "real estate/property" section where the general public can type in an address or a person's name and bring up photos and house info (value, dimensions, etc.) pretty scary! Even by knowing the city/state where you live, as well as your name and your husband's name, people kind glean more info than you would think. Please take this to heart- along with anyone else who may read this comment! I am praying for you and your family, that God will give you peace as well provide for you during this time!